As detailed in the last section, a nation’s competitiveness depends, among other things, on whether and how it educates and utilizes its female talent. As this awareness grows, coupled with better measurement, there is a growing demand from the public and private sectors for learning from existing practices to facilitate women’s integration into the workforce. Given the widespread benefits of increased gender parity, the short term costs and trade-offs associated with such practices may be viewed instead as a long-term investment. The Global Gender Gap Index indicates that, among the 142 countries covered, almost 93% of the gap in Educational Attainment has been closed. This means that countries are ideally poised to maximize opportunities for women’s participation in the labour market but many have failed to reap the returns from this investment. 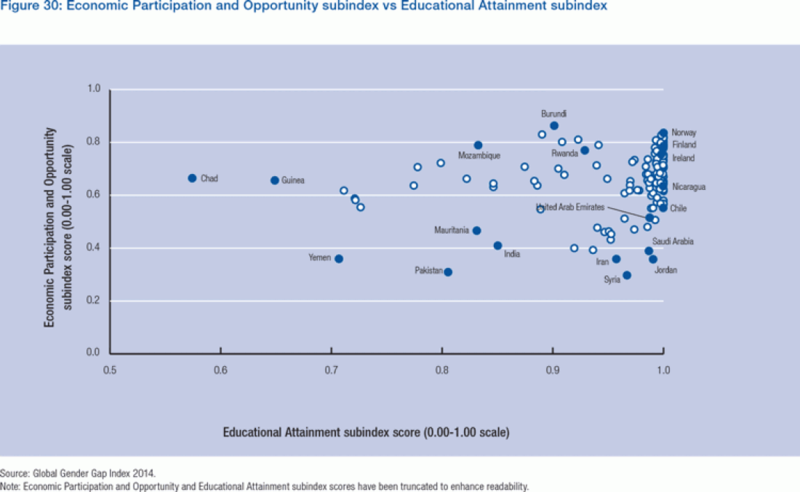 In Figure 30, we plot the Educational Attainment subindex against the Economic Participation and Opportunity subindex. The data reveals four broad groups of countries: (1) countries that are generally closing education gaps and show high levels of women’s economic participation, (2) countries that are generally closing education gaps but show low levels of women’s economic participation, (3) countries that have large education gaps as well as large gaps in women’s economic participation and (4) countries that have large education gaps but display small gaps in women’s economic participation. In the first broad group are countries that have made investments in women’s health and education and generally see the returns on this investment in terms of women’s economic and political participation. These countries include the Nordic countries, the United States, the Philippines, Canada, New Zealand and Australia. These countries have not, however, fully closed economic and participation gaps—in particular, the gaps in senior positions, wages and leadership levels still persist. In the second broad group are countries that have made the key investments in women’s education but have generally not removed barriers to women’s participation in the workforce and are thus not seeing returns on their investments in the development of one half of their human capital. This group includes Japan, United Arab Emirates, Chile and Brazil. These countries have an untapped but educated talent pool and would have much to gain through women’s greater participation in the workforce. In the third and fourth groups, the most basic investments in girls’ and women’s education still need to be made, and fundamental rights—including legal frameworks around inheritance, reproductive rights and violence—are often inadequate. The third group contains countries such as Yemen, Pakistan, India, and Mauritania that have large education as well as economic gender gaps. The fourth group contains countries such as Guinea, Chad, Mozambique and Burundi, which have large education gender gaps but small economic ones primarily due to high levels of participation by women in low-skilled work. Compared with the third group, women in these countries have greater access to income and decision-making. However, a substantial body of literature has shown that investing in girls’ education is one of the highest-return investments a developing economy can make and, for these countries, closing education gaps will remain an important factor over time. Government policy is critical for shaping the type of ecosystem that facilitates women’s economic participation, and many governments now institute policies that encourage women to work and make it easier for them to do so. Such policies can range from non-discrimination in hiring to maternity and paternity leave regimes to quotas encouraging women’s participation in economic life. For example personal income tax liability can affect workers’ decisions about how much or whether to work. Women, particularly those who are married, are more negatively affected by income tax rules. In contrast, childcare subsidies such as tax credits increase women’s participation in the labour force.28 As policy outcomes are better investigated, governments have a growing portfolio of tools available to address gender equality in the labour force. From 2011–2013, the World Economic forum conducted a survey of national policy frameworks relating to parental leave, childcare assistance, type of taxation and workplace equality.29 While these measures relate directly to promoting women’s employment, they are not exhaustive. In this section, we summarize some of the main findings of the survey on the levers currently used by governments around the world to integrate more women into the workforce. In addition, the Country Profiles contain detailed supplementary information on policy and legal frameworks. Family Leave. Maternity, paternity and parental leave—or any other type of additional shared leave—are closely associated with women’s economic participation in many parts of the world and are thus an important element of policies aimed at more efficient use of the country’s human capital pool. Parental benefits enabling mothers, fathers or both to take paid or unpaid time off to care for a child following birth can increase women’s participation in the workforce and foster a more equitable division of childrearing.30 For further details on the findings of the survey, including duration and provider of maternity, paternity and share leaves by region and income group please refer to Appendix F.
Among the 87 countries surveyed by the World Economic Forum, childcare assistance varies between economies and includes public daycare, private daycare and homecare, for which there may or may not be government assistance.32 Globally, public daycare with allowance represents 25% as compared to 11% of public daycare without allowance. Of the respondents, 21% say that the country offers private daycare with allowance as compared to 20% without allowance and homecare with allowance is offered by 10% of the respondents as compared to 13% without allowance. A majority of economies have public daycare assistance with government allowance or subvention (66.7%) while there are fewer countries that have government allowance for private daycare (55.2%). With homecare, it is more likely that there is no allowance offered. For further details about childcare assistance by region, please refer to the Appendix F.
Taxation systems. Tax legislation may contain potentially discriminatory provisions that treat men and women differently. For example, some forms of taxation might alter the disposable income available to men and women in a family and may thus have implications for the economic and social decision-making at the household level. The different forms of taxation on which questions were asked include individual taxation, income splitting33 and joint filing. Across regions, individual taxation tends to be most favourable for women; joint taxation tends to be least favourable. For further details about taxation system by region and income group, please refer to the Appendix F.
Awareness and accountability. The focus of many companies on building awareness indicates that the case for change still needs to be built to make progress. Accountably of the senior management and transparency of career paths and opportunities have proven to be effective practices. Ensuring that management policies, processes, systems and tools do not harbour gender- biased discrimination and enhancing the understanding of unconscious biases can also make inclusive leadership more tangible. Work environment and work- life balance. Women are often the primary caregiver for both children and the elderly in most countries. Ensuring smooth on- and off-ramping; appropriate childcare options; developing guidelines on implementation of work-life balance policies and mentoring for women going through a transition are important levers to ensure a sustained career progression towards management. For those companies that already offer parental leave, flexible working hours and other work-life balance programmes, the next steps lie in accelerating their use and acceptance of their female and male employees. Mentorship and training. Companies have benefitted from programmes that promote guidelines on the value of diversity as an underlying culture of the organization; impart knowledge on how to manage a more diverse workforce; and how to attract, retain and promote female talent. These training programmes, for both men and women, can be relevant for shaping an environment within the broader employee base for women to successfully lead. In addition, many companies have formal mentoring schemes for women seeking leadership positions, although they also find that high-potential women lack the sponsorship and tailored training needed to move into the executive ranks. A repositioning of the human resources directors beyond a focus on systems and administration to talent development and training can help address specific roadblocks for women, in addition to better overall talent management. It is important to emphasize that these interventions do not work as a checklist of actions that will each independently produce results.37 The right leadership context is critical, and it must be accompanied by a holistic set of priorities, long-term commitment and with a deep understanding of the corporate, industry, and cultural context, organizational culture and the local policy environment.